The United Nations on Sunday announced to launch humanitarian assistance for the millions of flood victims who have been affected by the moonsoon rains in Pakistan. According to the United Nations, many of the affected communities are still recovering from last year’s devastating nationwide floods. The humanitarian crisis was “still growing” after exceptionally heavy monsoon rains, says a press release issued by the Office for the Coordination of Humanitarian Affairs on Sunday. Torrential monsoon rains have pounded southern Pakistan, triggering serious flooding affecting more than 5 million people, among them communities still recovering from last year’s extraordinary floods. The disaster has reportedly taken the lives of 199 people, and destroyed or damaged nearly one million houses, and flooded 4.2 million acres of land, prompting the Government of Pakistan to call for support from the United Nations. The situation for those impacted by recent monsoons and subsequent floods is critical, with thousands of people in need of life-saving assistance due to the lack of food and safe drinking water, and the loss of livelihoods and homes. President Asif Ali Zardari and Prime Minister Yusuf Raza Gilani have sought international help after weeks of monsoon rains, which killed hundreds of people and displaced more than 4 million in Sindh province. The flash floods have caused widespread damage in 21 districts and destroyed crops over 1.7 million acres of land in Sindh, where hundreds of thousands of people are still suffering from the last year’s devastating floods. In response the United Nations and the National Disaster Management Authority (NDMA) undertook a joint field mission to see first hand the devastation and damage caused by fresh flooding. The NDMA chairman and UN humanitarian coordinator held discussions with the Sindh governor and chief minister. The joint mission team visited Thatta, Badin, T.M. Khan and Hyderabad districts, where they met with district officials and families displaced by floods. During the visit the NDMA chairman and the UN humanitarian coordinator gained first hand information about the impact of the floods, which led to a rapid launch of the relief effort by the United Nations and encouraged other humanitarian partners to support the ongoing national relief efforts. “The Government of Pakistan has responded swiftly to the recent disaster with all resources available at our disposal. The situation is still unfolding and with the forecast of new rains and likely depletion of local resources,” said NDMA Chairman Dr. Zafar Iqbal Qadir. “The Government has requested the international humanitarian community to come forward and share our burden for life saving areas that are shelter, food security, health and water, sanitation and hygiene, along with identifying any pressing needs in protection, nutrition and early recovery. The help is to be provided now before this disaster consumes more human lives in the country,” added the NDMA chairman. Sindh is by far the worst affected province with torrential rains in the hardest hit areas having led to rainfall exceeding, in a few days, what on average accumulates in an entire monsoon season. 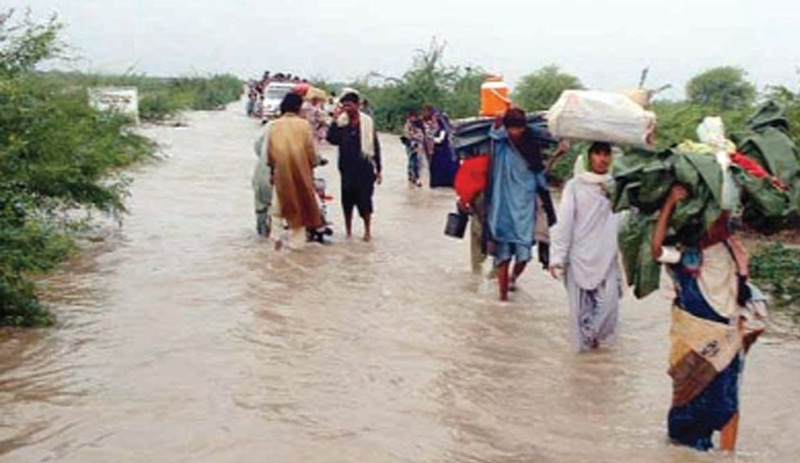 The government reports 22 out of 23 districts of Sindh, along with some parts of Balochistan, are covered in floodwater. The humanitarian crisis is growing by the day, with the latest reports indicating that around 4 million people are displaced and in need of immediate humanitarian assistance. To house the displaced families, the government has established 1400 camps to date across the flood-affected areas in Sindh. “Seeing first hand today the devastation and vast amount of floodwater in Sindh, now is a crucial time to stand in solidarity with the people of Pakistan, and build on the lessons learned from the recent 2010 floods response to support the government of Pakistan in their ongoing monsoon relief efforts,” said UN Humanitarian Coordinator in Pakistan Timo Pakkala. To date, the government has responded by providing 150,000 medical consultations, establishing fixed medical camps and mobile medical teams along with 17,000 water purification units, and distributing millions of aqua tabs and 25,000 jerry cans for collecting water. The government has also distributed 72,000 family tents and ordered 100,000 more to be supplied, and has provided approximately 600,000 food ration packs to the flood affected population. Despite such relief efforts, needs remain huge. At the request of the government, the United Nations agencies have started a humanitarian response and launched needs assessments. Rapid needs assessments are jointly being undertaken in Sindh, the results of which will support the development of a coordinated humanitarian response plan. Most acute needs are expected in shelter, food security, water, sanitation hygiene and health. Furthermore, needs assessments and response strategies include nutrition, protection and early recovery, including community restoration.